Italian architect Renzo Piano has completed his third building for Columbia University's new Manhattanville campus in Harlem, a project he describes as an "interesting experiment" in gentrification. 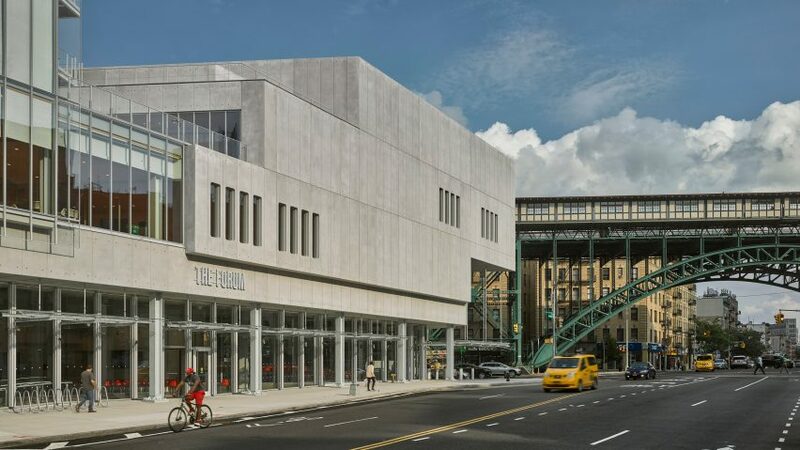 The glass and concrete structure known as The Forum joins the Pritzker Prize-winning architect's Lenfest Art Centre, which opened last year, and the Jerome L Greene Science Center in 2016 at the site – a few blocks north of Columbia University's historic campus in Morningside Heights. The Forum contains an auditorium, an information centre, a cafe with wi-fi, and flexible spaces open for community events. These are located the ground floor and wrapped in large expanses of glazing. Piano intends to draw in passers by and encourages them to "take their time". "In designing the masterplan for the campus and its first three buildings, we wanted to help Columbia as a global university in the city and for the city," he said in a project statement. "New York's streets and sidewalks are woven into the fabric of the campus," he added. "This is not like the campus of earlier centuries." The Forum follows the shape of the triangular corner plot created by the intersection of West 125th Street and Broadway. Also triangular is the volume clad in prefabricated concrete panels set above. It features three levels that step back at the rear – mirroring the shapes of his top-heavy arts building across the street – and ends in a cantilevered peak to cover the main entrance. Cylindrical mechanical systems rise from the roof, complementing the stripped-back materiality of the building and the surrounding 19th-century industrial architecture. The 437-seat auditorium occupies the top two levels of the concrete block. Wood panels partially line the walls and ceilings to improve acoustics, while the remaining surfaces are covered in a stony material. A glazed volume set on top of the other end of The Forum is occupied by offices that will initially be used for two programmes, including the Columbia World Projects initiative, which aims to solve global issues. The other is the Obama Foundation Scholars at Columbia: a year-long "academic and civic leadership programme" for a class of 12 pupils from Asia, Africa, South America, South Asia and Europe. Orange-hued carpets and furniture in the offices are among splashes of colour that run throughout the building, as well as stairwells with bold yellow walls. One of the staircases leads down to the building's basement, where a Central Energy Plant provides steam and chilled water used for heating and cooling. Piano's triptych of forum, arts centre and neuroscience research facility form part of the first phase of a masterplan for the Upper Manhattan site, which the architect has developed with architecture firm SOM. It involves the transformation of the Manhattanville neighbourhood – a former industrial site sandwiched between two elevated transport arteries – into a new hub for the university. Asked whether he considered the project problematic in terms of gentrifying the marginalised area, Piano described it as a "delicate matter" with unknown consequences. "Every time you work in the peripheries, you are always dealing with a delicate matter... because it's about transforming without losing the soul of somewhere," he told Dezeen at the opening of The Forum. "I don't have a formula, I think that this is a kind of interesting experiment." To avoid isolating the existing community, Piano's aim for the project is to create plenty of publicly accessible areas that could instead integrate it. For example, the light-filled Jerome L Greene Science Center and the top-heavy Lenfest arts building already house a public neuroscience Education Lab, a wellness centre and outreach programmes led by Columbia physicians. The Italian architect is also the focus of a major exhibition at the RA called Renzo Piano: The Art of Making Buildings, which focuses on his most important projects, like the Centre Pompidou in Paris, The Shard in London, and the Whitney Museum in New York. Photography is by Frank Oudeman, courtesy of Columbia University.